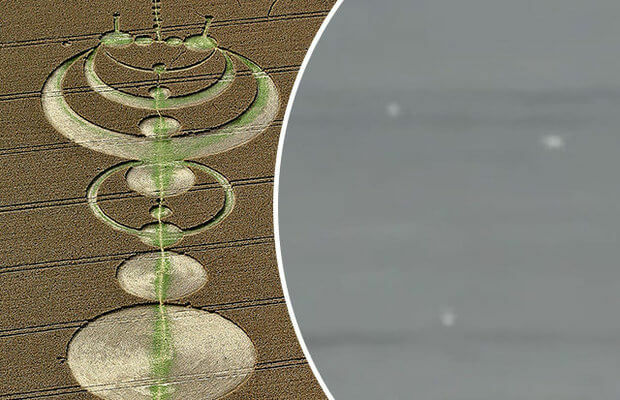 A CROP circle expert believes he has captured strange UFOs flying over one in the UK. Pierre Beake is convinced the mysterious marks in the countryside are the result of paranormal activity and not hoaxers. He has dedicated years of his life investigating the circles in the south west of England. And he was stunned when he captured a number of bizarre balls of light hovering around a well-known crop circle site in Wiltshire. In the video strange orbs of white light hover over the field as people explore the bizarre circle. They look to float but move erratically as they are filmed moving over the crop. Some alien hunters believe crop circles are created by UFO landings. But others say they are elaborate hoaxes, backed up by a video from 1991 of Doug Bower and David Chorley showing them using wooden planks and rope to create the patterns. This has not deterred Mr Beake, who claims the “highly geometric” circles could not be made by humans. Instead he is convinced aliens or some other paranormal reason are behind the phenomenon. Mr Beake revealed his footage and photography and the myth Glastonbury Symposium, a yearly event dedicated to the paranormal and conspiracy theories. He told AWP News: “When you go for the first time in a crop circle you can’t explain the feeling.